Don’t be an Ariel Square Four man. Ariel got it’s name from a Shakespeare’s play “The Tempest”. Shakespeare’s Character was a airy spirit based on a messenger of the gods, Mercury. 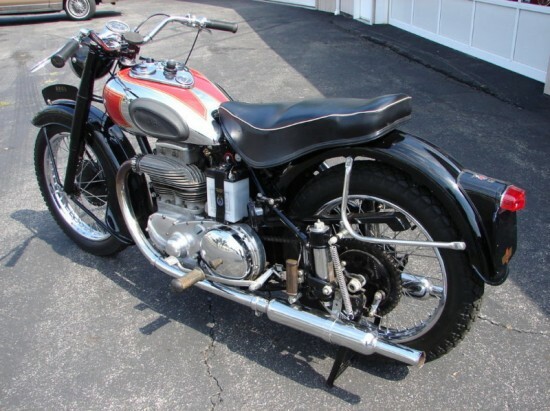 The company started with bicycles like a lot of other motorcycle manufacturers. One of the things that set them apart is that they made a motorized tricycle in 1898. I’d like to see one of those some day, sounds cool. In 1901 their first motorcycle was released it had a 211cc engine. They moved onto big singles and V-twins. Then in 1931 a 500cc square four was introduced. By the late 1930’s they had released a 1000cc square four. In 1953 they went to a four pipe square four. The bike you see here is a two pipe sq 4. A very unusual engine design with two cranks connected by a gear. This bike has a neat story of procurement from the seller. I like to here about bikes being taken down from the rafters and put back on the road. 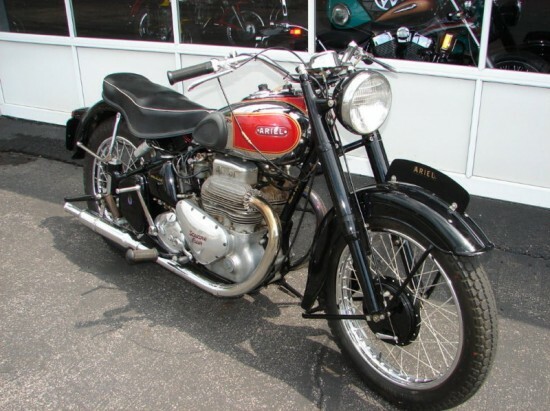 1950 Ariel Square 4 in excellent condition and with only 15,293 miles. Absolutely lovely bike, starts on the first kick, and rides perfectly. The 1000cc 4-cylinder engine is factory stock with no mods. Turn on the key, pull the choke, and starts easily on the first kick. Settles into a smooth quiet idle but has a very unique exhaust note that sounds like a V8 that snarls with revs above midrange (I’ve read that the sound is reminiscent of an Offenhauser racing engine). These are unusual engines; basically two vertical twins in one square block, with two separate crankshafts connected together with a large gear. Just rebuilt by Bancroft Vintage Motorworks; runs perfectly and without issue; no leaks, no noises. The 4-speed transmission shifts perfectly and the factory gearing allows relaxed 60 mph cruising while providing strong acceleration. Very pleasant bikes to ride; draws much interest at shows & bike night events. 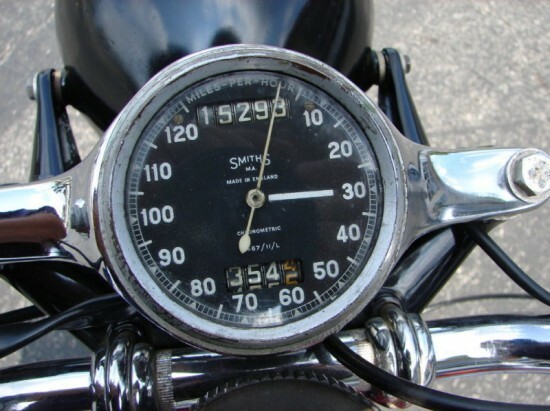 The headlight (high & low beam), tail light, brake light, and horn all work properly and the speedometer is accurate. Perfect chrome gas tank with red & gold trim. Perfect black lacquer forks, frame, and fenders. 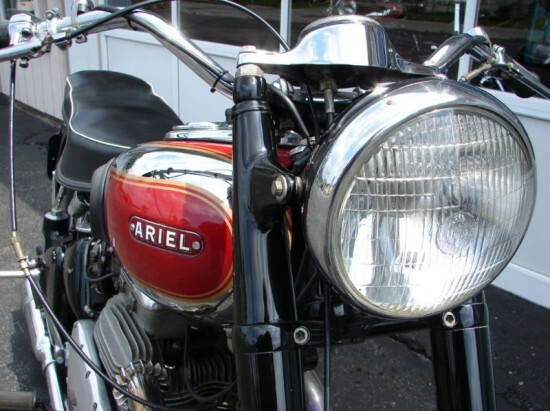 The original decals from Ariel are still in place and the original dealer’s sticker (Johnson Motors on West Pico Blvd in Los Angeles, California) is still on the rear fender. There is no rust. Perfect original exhaust & mufflers. Perfect chrome spoke wheels fitted with Dunlop tires. Incredibly nice bike. Note: I found this bike suspended from the ceiling over the bar in an Ohio restaurant, being used as a display. After much wrangling with the owner (who subsequently wanted my Velocette), I bought and brought it to Bancroft Vintage Motorworks since, although in perfect cosmetic condition, the bike had not been started or ridden in a few years. Mr. Bancroft disassembled & rebuilt the engine, repaired the electrical wiring, and went through the bike. A new battery, engine rebuild, carb rebuild, valve job, all new seals, all new fluids, and complete tune-up later, it started on the first kick and rode perfectly down the road. It now is fully road ready and will win trophies at virtually any show entered. It is still every bit a museum quality show bike but also a very capable rider as well. Gorgeous. This a very fine example of people trying new things to make their mark. The sq 4 has unique looks, sound and performance. I tend to like the unusual, it reminds me of a saying I heard somewhere, “if a bunch of people tell you it won’t work then your onto something special”. Sometimes they’re right and sometimes you leave a bookmark in history. Edward Turners 500cc OHC sq 4 left a mark that’s for sure.